The Bess Beetle behaves in many ways. 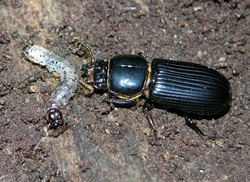 The Bess Beetle chews through wood and makes galleries and colonies. Bess Beetles are very social. The Bess Beetle is also very sensitive to air movement. Bess Beetles communicate with each other with a sound called stridulation. If they're disturbed they make a squeaky sound by rubbing their forewings (elytra) on their abdomen.